San Francisco, CA - April 8th, 2015 - Fiilex, a leader in LED lighting for the broadcast, film, and photo industries, is pleased to announce the release of two new lighting kits, the K201 and K202. These are the first two-point lighting kits to feature the P360 and P360EX, intended to provide film and photography professionals with a flexible travel set-up that leaves room for future lights or accessories. "We are always searching for new ways to make our kits more accessible for our end-users," Says Brent Siebenaler, Brand Manager of Fiilex. "We've done that with the K201 and K202, giving users a versatile, customizable lighting solution at a convenient price point." The K201 is a highly portable kit that offers two compact P360s. Designed for on-the-go interviews, these lights are dimmable and color tunable between 3000K-5600K, running on AC power as well as broadcast batteries. The two P360s generate a 700W total equivalent output, meet high color rendition standards (CRI>92) and pair easily with accessories to shape, soften, or focus the light. The kit includes an extra foam compartment for additional lights, accessories, or battery packs. The K202 is the All-Weather version of the K201, featuring two dynamic P360EXs for a total 800W combined output. The P360EX is water-resistant (IP-24), working reliably in the elements. The lights are also DMX-compatible, suited for situations requiring centralized or remote control over the lighting set-up. Ideal for professionals that need controllable light and enhanced durability for on-location work, the K202 includes additional space for lights, accessories, or battery packs. Both kits are available now from dealers throughout the U.S., Canada, and Europe. 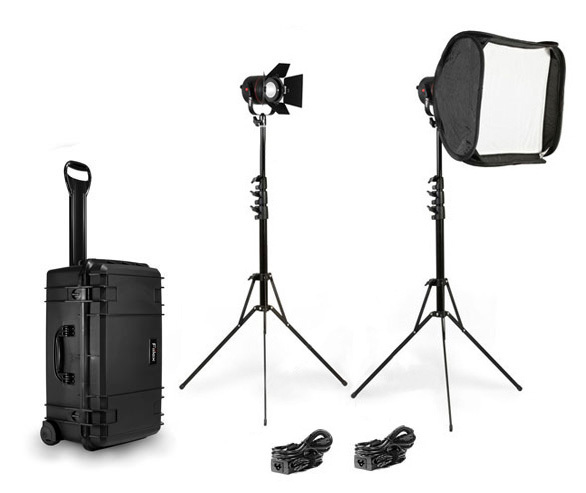 The K201 comes in a rolling travel case with two color-tunable P360 light heads, power adapters, barndoors, light stands, a softbox and a speed ring. The U.S. retail price is $1595.00. The K202 comes in a rolling travel case with two water-resistant P360EX light heads, power adapters, barndoors, light stands, a softbox and a speed ring. The U.S. retail price is $1995.00. For a complete list of dealers and accessories, please go to www.fiilex.com.